DETROIT—“She was a true Detroiter.” That is how Lydia Harris described Aretha Franklin as she stood outside in a long line waiting to enter Greater Grace Temple to pay her respects at the funeral service for the iconic vocalist. The city of Detroit is known for and by monikers and institutions, ‘The Motor City,’ ‘Motown’ and the NBA’s Pistons to name a few. However, it was also the beloved home of the “Queen of Soul,” Aretha Franklin. The legendary Ms. Franklin loved the city, its people—and they in turn, loved their “Queen.” It was evident by the outpouring of love and support by the thousands that flocked to honor her life and legacy during her Aug. 31 funeral service, which followed several days of events around the city that allowed ordinary residents to feel a part of paying homage to and bidding farewell to the musical legend. Events included, a tribute concert at New Bethel Church where her father, the Reverend C.L. Franklin was the longtime pastor, a public viewing of her body lying in repose at the Charles H. Wright Museum for African American History, a star-studded musical tribute concert at Chene Park and a modercade of pink Cadillac’s in homage to Ms. Franklin’s hit, “Freeway of Love,”—escorted her from the funeral. Ms. Franklin died Aug. 16 in Detroit after a long battle with pancreatic cancer. She was 76. Though born in Tennessee, she moved to Detroit with her parents as a young girl, and it was there a legend was cultivated and raised in a city she embraced her entire life. Wherever fame and fortune took her around the world, Aretha Franklin took Detroit with her. It was her down-to-earth nature that the hard-working people of Detroit, particularly its predominantly-Black population, embraced. It was not unheard of for her to be spotted out and about in the city, at the grocery store or other local stops. Larry Wallace, a local business owner, said he appreciated that the people of the city were given the opportunity to be a part of honoring Ms. Franklin. He came to the funeral service with his wife and daughter. “That was great on the city’s behalf to let us have the honor to do that. It means everything to me,” said Mr. Wallace, 53, who also told The Final Call that his mother went to school with Ms. Franklin. He, like others, grew up in a household filled with her music. Detroit has seen its fair share of tough times like the disappearance of a once thriving automobile industry, the 1967 rebellion that was a part of the country’s “Long Hot Summer” where escalating racial oppression saw Blacks rise up against police brutality and housing and job discrimination nearly a quarter century after the city’s 1943 race riots. Today, after several decades of hardships, gentrification and the struggle to rebuild and revitalize the once-thriving metropolis still pose challenges. But through it all, Ms. Franklin has been a constant, and she will always be appreciated for that, said residents. Testimonies of Ms. Franklin’s generosity in helping those less fortunate included her efforts in providing food to feed the homeless and donating money to families or individuals who were experiencing tragedies or difficulties. Her giving nature left an indelible mark on the city. Ms. Franklin’s contributions often went without much fanfare. There are reports she would purchase lunch for high school students who could not afford it; she donated thousands of dollars regularly to New Bethel Church where she would also perform charitable concerts and provide free food to those in attendance. The Detroit News reported that when Ms. Franklin was honored by the Grammy Awards in 2008 as its MusiCares Person of the Year in part for her charitable contributions to organizations such as Save the Children and Easterseals, she was singled out for support of churches and food banks in Metro Detroit. The dinner, which included the auction of a pink Franklin-autographed Cadillac CTS for $51,500, raised $4.5 million. In 2003, she was named a Michiganian of the Year. In June of last year, a portion of Madison Street in the city was renamed Aretha Franklin Way. Around the city, colorful murals emblazoned with images of Ms. Franklin were on display. Throughout the days leading up to her funeral, her classic tunes could be heard blaring from cars, residences and in restaurants around the city. 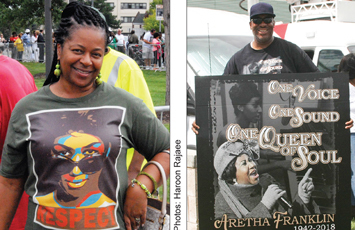 City officials paid their respects in many ways and ensured “Detroit’s Queen” will be in the hearts, minds and memories of the city for generations to come. Detroit Mayor Mike Duggan announced plans to rename Chene Park Aretha Franklin Park. “Our beautiful waterfront jewel will be Aretha Franklin Park and when performers from generations to come from around the world come here, they’ll be reminded that they are performing at the home of the Queen of Soul,” said the mayor. Detroit City Council President Brenda Jones issued a resolution for the name change and said an ordinance would follow—which would be law—to make sure the park would always carry Ms. Franklin’s name. Michigan Governor Rick Snyder said that in the 1980s the Michigan Department of Natural Resources declared Ms. Franklin’s voice a natural resource of the state. Calvin Miller became choked up, as he watched the funeral service outside the church on a big screen setup near a gas station down the street. He wore a shirt with her picture on the front. It was a heavenly send off, he said. The Detroit native said he had the opportunity to attend one of Ms. Franklin’s last concerts in 2016. “She witnessed a lot. You know she was a real woman and she was blessed,” he said, voice trembling as tears brimmed his eyes. Yolanda Flye lives in downtown Detroit in the same apartment community as Ms. Franklin. Sharon Stokes lives in Warren, Mich., but is a native of Detroit. She was born in 1959 and all throughout the ‘60s her mother played Ms. Franklin’s music. “Her voice alone is what always pierced through my heart. I would dance and sing her songs all the time,” said Ms. Stokes. But it was more than her powerful and soulful voice that resonated, she explained. “All these years that I have known all these people from here, the only one I can say truly that when she came to Detroit she stayed right here in Detroit and that’s what made me a believer in her; that all these years regardless of what’s going on in her life, she has stayed right here in Detroit,” said Ms. Stokes.